54" round x 30" hogh. 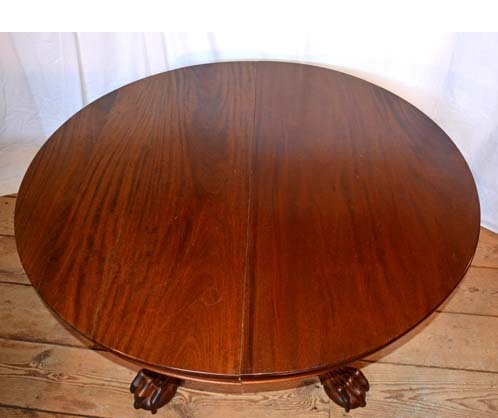 Here is a gorgeous solid 54" Round Mahogany Table with 6 - 9" Leaves. If you are looking for a large table, this is the one for you! 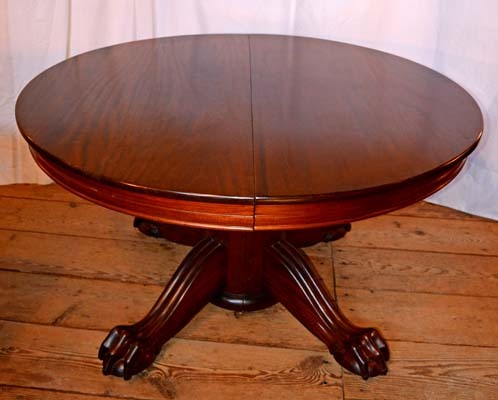 The table has a large claw footed base which opens up and supports the table from each end, and a center leg which supports the leaves - no sagging. When the table is closed, it acts as a round unit with the center leg closed invisibly inside the base. The table is versatile and can be used with any number of leaves needed. This is a great table with lasting qualities, so contact BARN ON 26 ANTIQUES to purchase.